and, what exactly are we giving away? 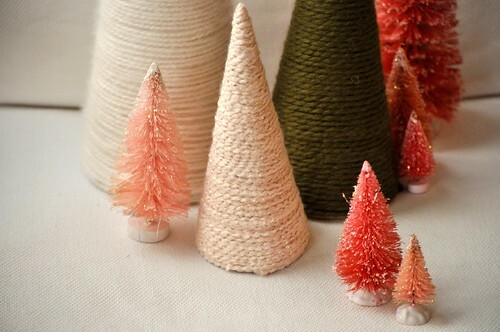 a set of three yarn Christmas trees. It's gets better: you choose the colors. *To enter the give-away, simply leave me a comment telling me what colors you would choose for your trees. A winner will be chosen at noon on Thanksgiving day. heather grey, dark grey, green! these are so adorable! Rust, Mustard, & Olive Green because they would match my living room all year long! :) LOVE watching all your ideas!!! You are so creative! The trees are very cute! I would pick grey, rust, and olive green! Count me down for all three in snow white! YAY!!! So Lovely! Any of the colors are great, but I do like the emerald green and creamy white. Oh- and the yellow! Hi Sarah!! I just love your Cranny site!! You are very gifted. Hope you and Steve are doing well. Mr. Graeme is just adorable!! These trees are too cute! I would choose the snow white, olive green, and rust! May God bless your adoption journey, and we hope to see you all again soon! You have such great ideas Sarah!! These are beautiful! You do amazing things with yarn. I would probably choose peacock, emerald sea and mustard. Love them! I would choose gold, ivory, dark green, light green and red. I would have to choose all three in the very crafty, snow crest looking creamy azure. So cute! I've enjoyed looking through your stuff. Keep it coming! These are just wonderful. I would chose creamy azure, gray, and olive green. LOVE. Olive green, grey and the snow white. These are gorgeous. Wow! Those are so cute!! I'm going to go with Olive, Rust and Grey....Would look perfect on our mantle for the holidays!! Love these! I would pick rust, snow white, and olive green. I love the olive green and greys!! These are so cute! I would go with snow white and olive green! These would look absolutely amazing in my room! The peacock color is just a shade lighter than my wall color!!! I love these, Sarah, and all of your ideas. I'm eyeing some of your baby things and hoping I can scrounge up enough cash to buy them before our little boy arrives in March! :) I'd pick olive green, rust, and grey for the trees. I've been wanting something cool for our mantle, and these would be PERFECT!! I would take snow white, grey, & mustard!! Love these! Grey, Peacock and Snow White would be my trio of choice. Love the cream! Actually I love them all..beautiful! Love, love, love!!! I would pick exactly what you have pictured. I'd choose pearl pink, peacock and either snow white or grey. So lovely!! I would choose Rust, Olive Green, and Mustard. What beautiful trees and soooo creative. Love them and everything else you make! Thanks for such a wonderful giveaway. These are adorable. I especially love the snow white and creamy azure colors. PS...your yarn wreaths are fab too! These are lovely, Sarah. The creamy azure and snow white are fabo. Yea, Sarah! Look at all these comments and lovers of your blog:) How do you pick just one color when those three colors look so lovely together. I guess I would choose the pearl pink because it reminds me of freshly fallen snow! emerald sea, and snow white ones. They are beautiful Sarah!! Peacock, Pink and White....so creative and beautifully clean and simple!!! These are so fun! I would choose the same colors you have pictured. Those look beautiful together. What a generous giveaway! snow white, pearl pink, and olive green! these are so sweet. WOW! Thanks so much for a giveaway. I agree with Erin. "Torture" to decide on the colors! :) I guess I'll go with grey, green, and rust. I love that really fuzzy guy. He's cute! Thanks for throwing in a bottle brush tree as well. sweet! Emerald, peacock and white are gorgeous! I thought I knew what I would say until I started reading everyone else's ideas. Rats, now I don't know. Maybe because I live in all white walls, I would like three shades of green, maybe a military green, a grass green and a bright almost yellowish green. Adorable! The best thing is that these trees are so simple yet so decorative. I love the white and green--however, I would add some red in there as well. Perfect for the Holidays!!! THANKS! These are the cutest! Snow white, peacock and mustard are my favorites! Olive green, rust and snow white! Love these! what a great giveaway! I would choose peacock, snow white and creamy azure, but I love all the colors! I would choose the olive green & snow white. Lovely little pieces you have there, missy! These are so classy. creamy azure, peacock and emerald sea. Love them! I'd chose mustard, peacock, and rust. Love the trees first time on your sight so off to explore. I would love the white, peacock and grey! Lovely! The peacock and snow white are just beautiful! Very cute! Creamy azure, emerald sea, and peacock please! These are so cute! creamy azure, emerald sea, and snow white. swooooooon. Oh my goodness, those are sooooooooo adorable!!! I love the off-white ones. I would choose Olive Green, Peacock, and Grey...Thanks for the heads-up on this giveaway, knack! And, of course, thanks to you! I would love any colors together, maybe pink and a cranberry red and one creamy one. Lovely!! oooh I have been eyeing your beautiful work ever since your sis put on about your door sweaters. 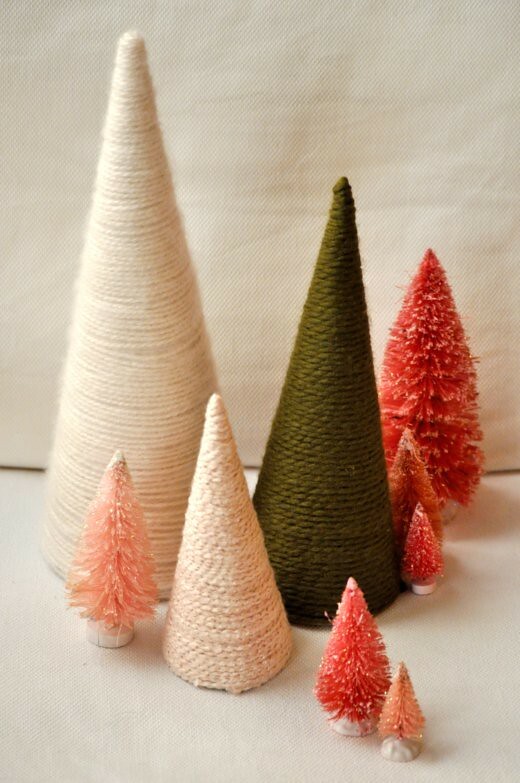 These yarn trees are lovely. 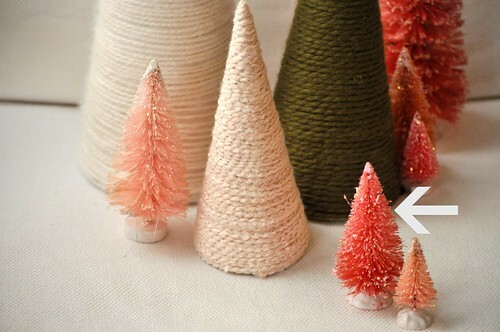 If I were to display them in my house I'd pick the colors ivory, light pink, and hot pink to bring color to christmas.